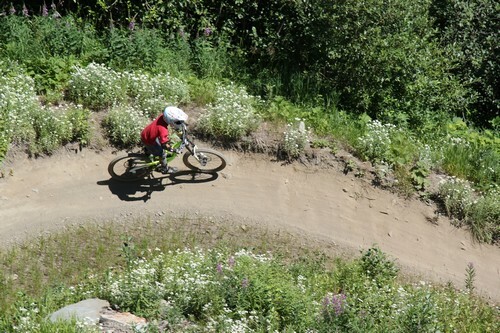 Sun Peaks mountain biking offers cross-country mountain biking as well as a world-class downhill bike park, with many kilometers of different level trails for beginners to expert downhill bikers. Sun Peaks Resort is also constantly working to improve their network of cross-country and downhill trails, and was recently recognized as having one of the Top 10 Mountain Bike Parks in the world. Save up to 30% on your lift-accessed hiking or biking pass - buy online and in advance via the Liftopia link on the left of your screen. But you don't have to be an expert to mountain bike around Sun Peaks, there are trails for all ages and levels of conditioning - just get up here and enjoy the fresh air, beautiful scenery, and exercise! Bring either just yourself and your armour, or bring your family and friends, but come up the hill to chill this summer and see why Sun Peaks is earning world-wide praise and recognition for their bike park and scenic cross country network of trails for all levels and abilities. Lower trails are free-to-use from spring to fall. Summer bike and safety gear rentals are also available. Sun Peaks offers a number of different cross-country bike trails that take you around, above, or through the beautiful countryside and quaint European-style ski village. New trails, including a second lift accessed, cross-country bike trail, are being opened in 2014 which will give even more variety of trails to choose from. Some are totally free with no special bike or safety equipment needed except an approved bike safety helmet, while others are lift-accessed and only available during the summer months (mid to late June to end of September) for a small fee and require more safety gear. 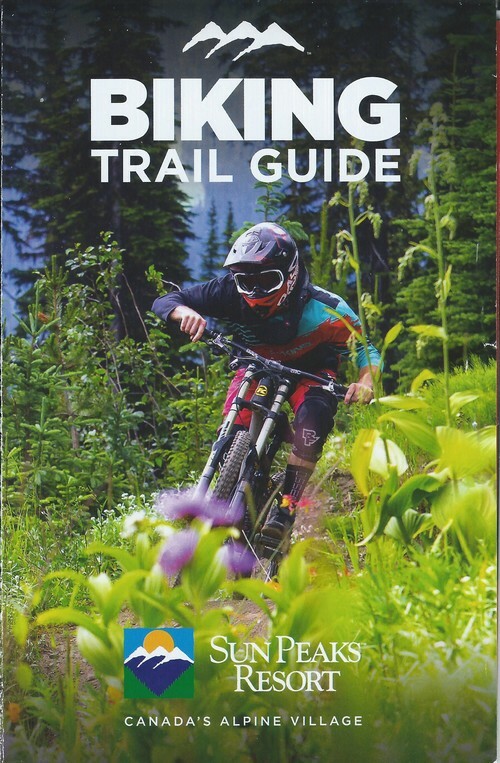 Helpful hint: New for 2014 – detailed Sun Peaks Mountain Biking Trail maps are now available from the Sun Peaks Adventure Center, in most Sun Peaks hotel lobbies, or in our Best Sun Peaks condo or Best Sun Peaks townhouse for our guests. So grab your bike (or book a rental at Elevation), your safety gear, water, snacks, sunscreen, and get biking! The simplest of the Sun Peaks mountain biking cross-country trails is the 6 km loop, pedestrian friendly, Valley Trail Network, which winds its way throughout the village area, from Parking Lot #5 across from Stone’s Throw, out to Burfield Drive past the entrance to Sun Peaks Resort. The Valley Trail is mainly paved, pretty flat, and an enjoyable way to safely explore the village and surrounding areas. Don’t be surprised if you find yourselves thinking about Sun Peaks Real Estate after cycling through some of the Sun Peaks developments. In 2014, the Valley Trail was expanded with various dirt trails to complete the low elevation loop around Sun Peaks. Please remember to be safe and courteous to pedestrians, pets and wildlife that may also be enjoying the Valley Trail Network. Leave the village behind and head out on the Mt. Morrisey Trail Network, the next easiest set of trails. Beautiful, scenic and ‘away from it all’ Nordic skiing in winter and the same for cross-country Sun Peaks mountain biking in the summer months. Grab your free Sun Peaks Bike Trail map and explore the wilderness back-country area without having to buy a lift ticket. There are a number of wide, marked routes to take, some great singletrack routes to discover along the way, and you can even meet up and continue on with the next cross-country biking option, the McGillivray Lake Trail. 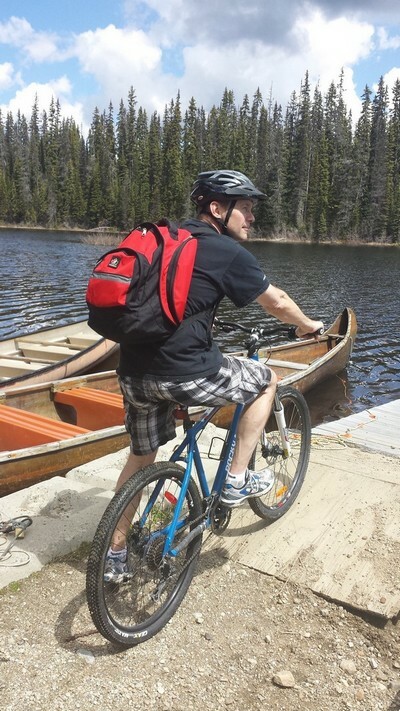 The last of the free cross-country bike trails is our favorite, the McGillivray Lake Trail. It is a roughly 10km loop, with a long, low-grade (around 150 meters, 500 feet) rise out to the lake and McGillivray Lake nordic ski warming hut, and a wonderful downhill ride back!! While at the lake, you may even see the Voyageurs out enjoying a guided Sun Peaks Canoe tour, or others who have rented kayaks or canoes in the village to explore this beautiful 3km x 1km wilderness lake. They use the hut for their delicious Voyageur-style add-on lunches and dinners after the canoe trips, so you may see the hut getting all ready to host their summer guests. Access to the McGillivray Lake Trail is across from Stone’s Throw (and our Best Sun Peaks condo) via the Vista Trailhead, near the Morrisey Express chairlift – just follow the signs. Head southwest to the lake and be prepared for a bit of a workout, especially when the trails are wet and still partially snow-covered in the early spring when we went, or after heavy rains. The ride goes much faster (and easier) on the way back, where you can either follow the same route back or veer off on the Otter Loop to Great Grey, or Black Bear trail back to the Vista trail, and then back to the village. 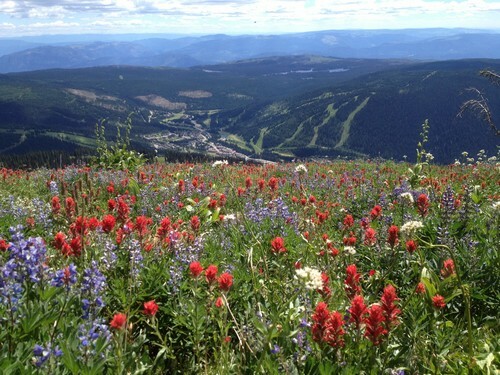 Sun Peaks Resort was a Western Canadian leader in the development of lift-accessed trails so that regular bike riders can enjoy the thrill of a little downhill Sun Peaks mountain biking with the spectacular panoramic views that Sun Peaks offers. And they continue to lead with the addition of new lift-accessed trails for the summer of 2014. We plan to explore these trails ASAP and provide our trail reviews soon. Big Rock Ride is the first of the Sun Peaks lift-accessed cross country mountain bike trails and is a scenic 10km, 595 meter descent trail for intermediate bikers. 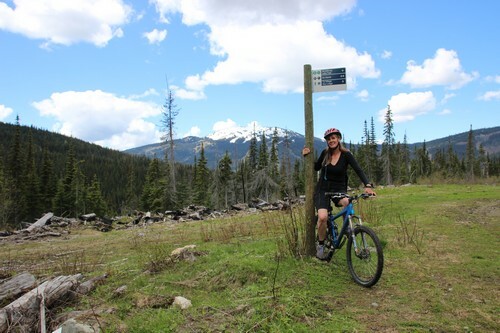 Your Sun Peaks biking lift pass gets you and your bike quickly and easily to the top of the Sunburst Express chairlift, and then travel along the singletrack trail through beautiful wildflower meadows and scenic forests over to the top of the Sundance chairlift. 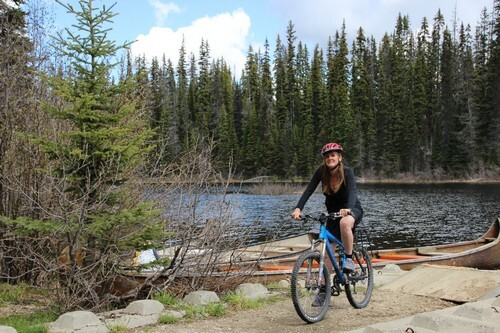 From there, it’s a quick, downhill ride to the McGillivray Lake forestry road where you can choose to continue downhill to the village, head to McGillivray Lake for a quick look-around or swim before heading back to the village, or get some more exercise by choosing various cross country routes from the Mt. Morrisey trail network. New in 2014 to Sun Peaks Mountain Biking is the very cool, second Sun Peaks lift-accessed trail – 'Altitude' Alpine Trail (11.5km return). From the top of the Sunburst chair, intermediate bikers can head out and back on a single-track trail through beautiful alpine meadows and forests, and past the peaks of Mt. Tod. Once there, you have the option of locking up your bikes and hiking along a beautiful 1.5 km trail to the summit of Mt. Tod and scenic Tod Lake, enjoying a wonderful picnic, or just taking in the scenery. Once you've enjoyed the top, hike and bike back to the chairlift, and either download or continue on your spectacular day of biking by joining onto the Big Rock Ride and the network of connecting cross-country trails to get back to the village. Guided tours and mountain bike lessons can be arranged, and even little electric motors can be added to your Sun Peaks mountain biking experience through the Adventure Center to make it an even better Best Sun Peaks mountain biking experience! View the Sun Peaks online Bike Trails map. Interested in something a little more extreme? Check out the Sun Peaks world-class bike park.